Kamchatka Peninsula, Russia | Tailwaters Fly Fishing Co. The Kamchatka Peninsula is located only 4.5 hours west of Anchorage, AK across the Bering Sea. Anglers start the journey with traveling to Anchorage for overnight in a hotel Sunday night following by a Monday morning flight to Petropavlovsk, Russia (PKC) on once a week commercial service with Yakutia Airlines. Rainbow trout are the primary target species, however Kamchatka is home to 1/3rd of the world’s five species of Pacific salmon as well as dolly varden, grayling, and Khundza Char (ferocious sea-run char that often exceed 30-35+ inches on some rivers). Some rivers are classic spring creeks with easy wading and excellent dry fly or mouse fishing, while some are larger freestones that dictate swinging streamers for some of the largest trout you can imagine. Other river systems offer a little of both! (See THE FISHING for a detailed description of all the rivers and programs). The 2017 Kamchatka season will run from July 17 – September 4, 2017 for anglers traveling with Yakutia Airlines via Anchorage. Is Kamchatka Right For You? Kamchatka is not for everyone… and it is certainly not a trip for sissies! This is a legit wilderness and trophy trout fishing experience like none other, and is perfect for folks who appreciate a sense of adventure and complete remoteness. 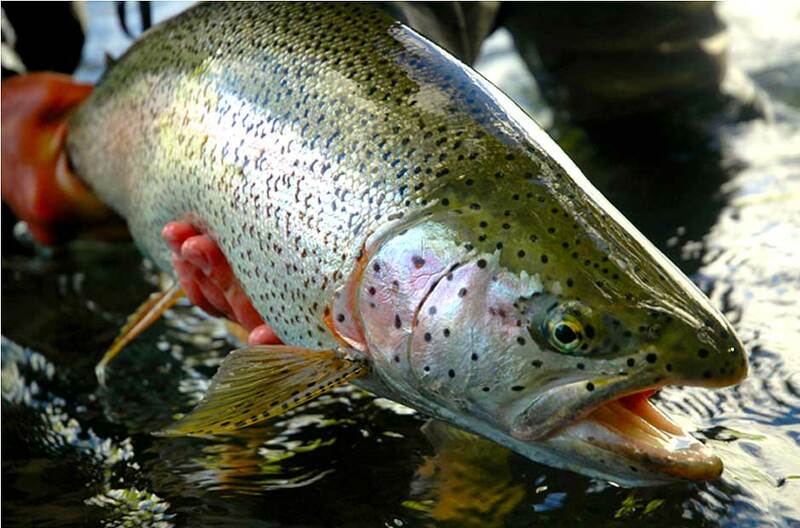 If you are simply after a 30” rainbow – go to Alaska! If you are interested in becoming one of a select few (if not the first) to wet a fly line in a uniquely pristine and untouched rainbow trout paradise, this is the trip for you. Travel expenses include airfare to/from Anchorage, accommodations in Anchorage Friday night prior to Saturday flight to Kamchatka. Other travel expenses of approximately $2500 cover round trip airfare to Petropavlovsk & Russian Visa. Additional expenses are not limited to gratuity (approx. $650/week recommended), fishing licenses and alcoholic beverages. (See RATES for details). Words simply cannot describe the world-class trout fishing, the adventure, or the cultural education experienced on a trip to the Kamchatka Peninsula in eastern Russia. You have to see it to believe it. It is impossible to describe the feeling of excitement when the engines are lit on the Russian made Mi-8 helicopter bound for one of the most remote and seldom fished trout streams on the planet. It is an emotion not felt with any other exotic angling adventure — a fresh curiosity about a destination this remote and pristine. The Kamchatka Peninsula is without question one of the most special wildernesses remaining on the planet. Kamchatka is a true peninsula approximately the same size as California with only 375,000 residents (less than one person per square kilometer). There is no development, no roads, no logging, no pollution, no poaching, and certainly no fishing pressure. In many ways the Kamchatka Peninsula is very similar to Alaska, only without the crowds or the development. It is a place of breathtaking beauty and unique wildlife, mixing striking scenery of mountains, tundra, forests and rugged coastline. Russia’s largest volcano belt made up of twenty-nine active craters stretches along its shore, many of which are seen and heard from each of the rivers fished. It is hard to imagine a more idyllic and untouched landscape. Big and beautiful rainbow trout are the target species, however prolific numbers of Pacific salmon are found in all the rivers we represent (1/3rd of the world’s Pacific Salmon return to spawn in Kamchatka). Later in the season anglers also encounter loads of dolly varden and Khundza (an Asian char that eats everything and often busts the 40” mark!). In addition to annual exploratory trips to new and unknown venues, Tailwaters represents diverse fishing programs in three separate regions of Kamchatka. Whether it is high volume dry fly and mouse fishing on a perfect spring creek, or swinging flies on a larger freestone for enormous JUMBO sized Rainbows in the 30+ inch range (or a little of both) — Kamchatka offers a setting, accommodation type, and style of fishing for every type of angler. Less than forty anglers a year fish our rivers for a short eight-week season. In a shrinking world where human footprints mark the riverbanks almost everywhere, Kamchatka offers the refreshing feeling of a fishery that has simply been left alone. Having spent a number of weeks fishing and exploring many of Kamchatka’s river systems over the last several years, we must say there is simply no better all around rainbow trout fishing destination to be found. 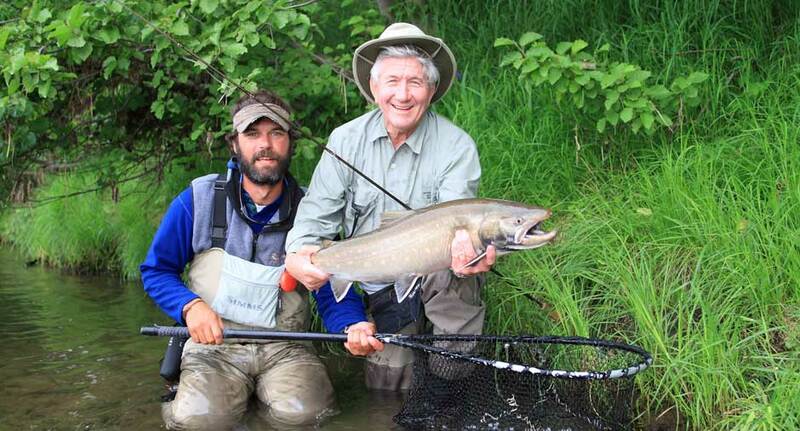 Sure you can catch trout just as big in Alaska, however the sum of all the parts are what make Kamchatka so special. The historical and political significance of this formerly Soviet naval hotbed is a perspective jolt for even the most adventurous traveler. Our Russian Outfitters have been rock solid for over ten years, and deliver a safe and organized program in one of the worlds most remote and beautiful wildernesses. Tailwaters has been involved with the fishing programs in Kamchatka since 2003, and understand the ins and outs of traveling, exploring, and fishing this rainbow trout fantasyland. Each of Kamchatka’s rivers shares many similarities and differences, allowing us to match up your expectations, preferences, and angling style with the correct fishery. Some of the trips are float trips where anglers visit multiple camps, while some are jet boat camps where anglers spend the week in the same camp but cover miles of water using powerboats. Some rivers are giant freestones that are home to the biggest trout on the globe, some are smaller spring creeks that are more conducive to dry fly fishing for larger numbers. Each program only accommodates four to six anglers, which makes for a very intimate and private group setting. There is no doubt that this is a hard-core fishing trip, however the fishing schedule is actually quite civilized. Camps are very comfortable, there are no early morning wake up calls, and everyone enjoys a made to order breakfast and hot coffee before the day begins. Based upon our personal experience exploring and fishing Kamchatka since 2003, we strongly feel that the quality of the rainbow trout fishing in Kamchatka is unsurpassed anywhere on the planet. Only forty-five anglers fish each program we represent during the summer season. Each stretch of river is well rested and the fish are very eager and cooperative. There is no other place on the planet where fly-rodders can expect to find such high numbers of quality, large, uneducated trout. Equally as unique is the bizarre fact that the trout in most fisheries of Kamchatka would rather eat a dry fly or a mouse pattern than they would a salmon egg pattern; despite the presence of enormous runs of all five species of pacific salmon. This is very refreshing to those who have fished Alaska and were disappointed with exclusively swinging flies or drifting an egg pattern with an indicator as a mandatory technique in order to have success. Although trophy trout are the targeted species, in addition to an abundance of arctic grayling every river hosts huge runs of anadromous fishes such as all five species of salmon, char, dolly varden, steelhead, and khundza (an eastern Pacific species of char found only in Kamchatka) as well. Depending upon what river and what time of the season you elect to visit Kamchatka, these species can all be taken in abundance on dry flies, mice, and streamer patterns. It is also important to mention that on every trip, jet boats and rafts are used exclusively for transportation — nearly all of the fishing is done wading. It is often said that Kamchatka is Alaska one hundred years ago. Kamchatka is the last known place on the planet where you can find pure strain populations of several rainbow trout subspecies that have not suffered from the influence of humans. Unlike the rest of the trout’s kingdom, there have been no hatchery fish introduced and very little poaching or pollution has had an effect on the trout populations. As a result Kamchatka provides a pristine environment for western anglers to catch huge fish that have never seen a fly, and is an ideal laboratory for scientists to learn about a species in its original condition and habitat. The average fish caught each season on some rivers has exceeded twenty-five inches, while other drainages consistently yield forty-fifty fish a day (or even more) in the 18-27 inch range – the majority of which are taken on mouse patterns and high floating dry flies. In all honesty, there really seems to be no small fish! But perhaps the most appealing aspect to a trip in Kamchatka is the solitude, remoteness and exclusively of this wonderful fishery. It is a special feeling to haul in a monster rainbow on a size #10 caddis pattern, all the while knowing that there is not another human (much less another angler) within hundreds of miles! The following is a list and description of each river system as well as fishing and lodging program we represent on the Kamchatka Peninsula. Each program is differing in the style of fishing, character, accommodations, size and average numbers of fish typically taken, and helicopter flight distance from Petropavlovsk. The Zhupanova is perhaps the most beautiful and scenic river in Kamchatka. Its close proximity to Petropavlovsk (one hour by helicopter) and its huge Rainbows make it perhaps the most popular river on the peninsula. The average trout living in the Zhupanova is a solid twenty-five inches! Later in the season around the first week of August, huge white spotted char known as Khundza arrive which average around twenty-seven inches and some of these voracious critters easily bust thirty-five inches and are a rod breaking fight on a seven weight. Of course there are also enormous runs of all five species of salmon (particularly the silver or Coho), however most anglers soon discover that they are in search of the huge rainbows and do not pay any attention to the salmon. Also found in excessive numbers are aggressive dolly varden that are easy to catch, make for good photos, and will grab a mouse or flesh fly with abandon. The Zhupanova is a river for those angers that are willing to trade in large numbers of fish and dry flies, for sheer size. Because this river is enormous freestone and the fish are huge, six and seven weight rods are mandatory (spey and switch rods are popular as well) and conditions often dictate exclusively fishing streamers and sinking lines. If you are a dry fly purist and need twenty-five fish days to make you happy, the Zhupanova is not for you. However, the majority of the season anglers do have excellent success skating large dry flies (steelhead style) and mouse patterns as well. The Zhupanova may be the best river on the planet to have a shot at a real trophy wild trout in a traditional, easily wadeable, freestone setting. Our Zhupanova Float trip takes six guests a week. Anglers float between six pre-established camps over nearly thirty miles of river. 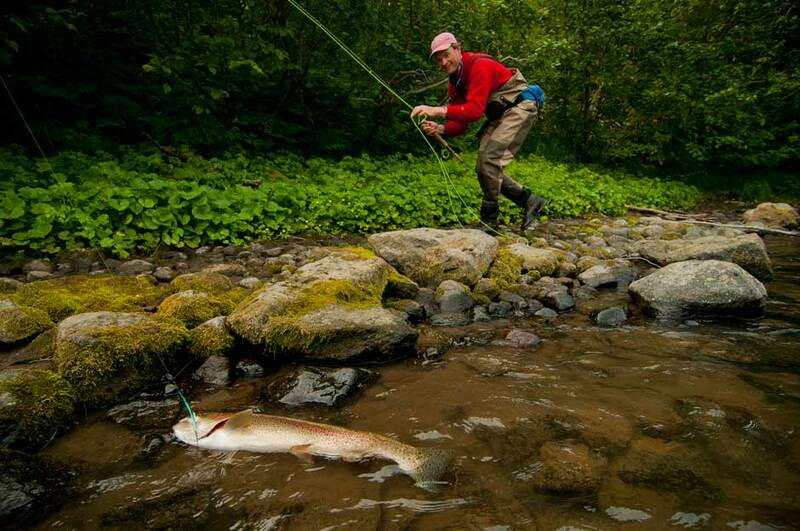 Similar to all of the trout programs we represent, all of the fishing is done wading. The large inflatable rafts used carry two anglers and a guide per boat, and are purely for transportation between fishing spots and camps. Huge cottonwood, birch, and aspen trees, snowcapped mountains, and volcanoes line the river — not to mention the occasional brown bear doing a little fishing of his own. Zendzur Lodge on the lower Zhupanova River sits in the shadow of a snow-capped volcano, and is surrounded by a thick forest wilderness. Anglers at Zendzur utilize “Alaskan-style” jet-boats to access 25 miles of classic freestone riffles and runs. They average 24 – 26 inches and reach a JumBOW maximum somewhere in the 33-35 inch range. Like the rest of Kamchatkan trout, they regularly crush skated mouse patterns, swung streamers on sink-tip lines, and on occasion traditional Western dry flies. The river also has similar runs of huge Asiatic white-spotted char, or “kundzha” (25-40 inches long), as well as Dolly Varden and Silver Salmon starting in early August. Zendzur Lodge itself is a beautiful, traditional Russian wilderness outpost, hidden on the edge of a birch and cottonwood forest. Staffed with a combination of talented American and Russian professionals, lodge amenities are surprisingly deluxe, given the remote nature of the operation. They include double and triple rooms, each with a private bathroom, shower and sitting room. One of the highlights of Zendzur is the fabulous on-site natural hot-springs, enclosed in a banya house, just down from the Lodge on the riverbank. The style and quality of accommodations at Zendzur Lodge are — by quite a wide margin — the best in Kamchatka. Plush accommodations combined with the trophy size of Zendzur trout, world-record kundzha char, and the variety of gamefish available, makes Zendzur Lodge one of Kamchatka’s most unique programs available. The Sedanka is a classic Spring Creek and is without doubt Kamchatka’s best dry fly river. If you are interested in fishing mouse patterns and dry flies, this is the river for you. The Sedanka is a perfect mixture of the Henry’s Fork and the Madison classic spring creek slicks separated by a series of riffles and braided sections. The average depth of the stream is roughly to your knees, making the entire river easily wadeable and easy to fish. Typically, anglers find themselves fishing a mouse pattern to eager fish all morning and switching to a dry fly after lunch once you start seeing rising fish. Despite the presence of a huge sockeye run in the Sedanka, anglers can expect to take high numbers of trout on very basic, high floating dry flies every day under normal conditions. The average trout on the Sedanka is a solid twenty inches, with several fish in the 25-26 inch range taken weekly or even daily as well. Again, 100% of the fishing is done wading the shallow pools and riffles on the Sedanka. Anglers float between two fixed camps wading various stretches of river along the way. 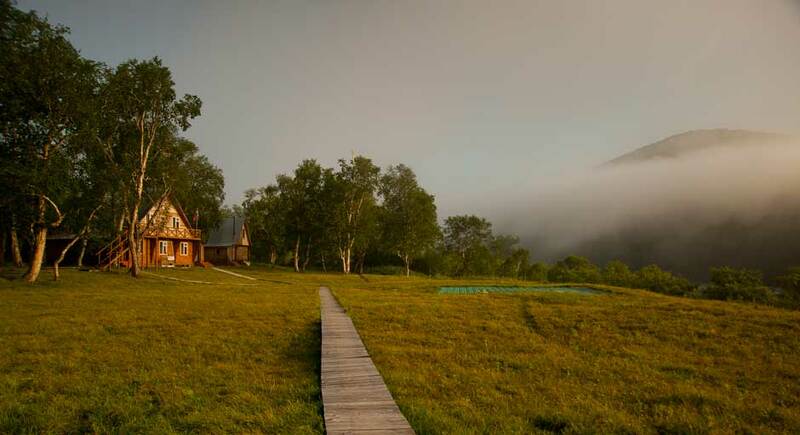 The facilities on the Sedanka are the most developed and comfortable camps on our northern rivers. Spacious yurt tents, heated showers and dressing rooms, log cabin dining facilities, flushing toilets, and of course around the clock electricity provide all the creature comforts for the more high maintenance angler. If you are a dry fly fishing purist, look no further than the Sedanka. 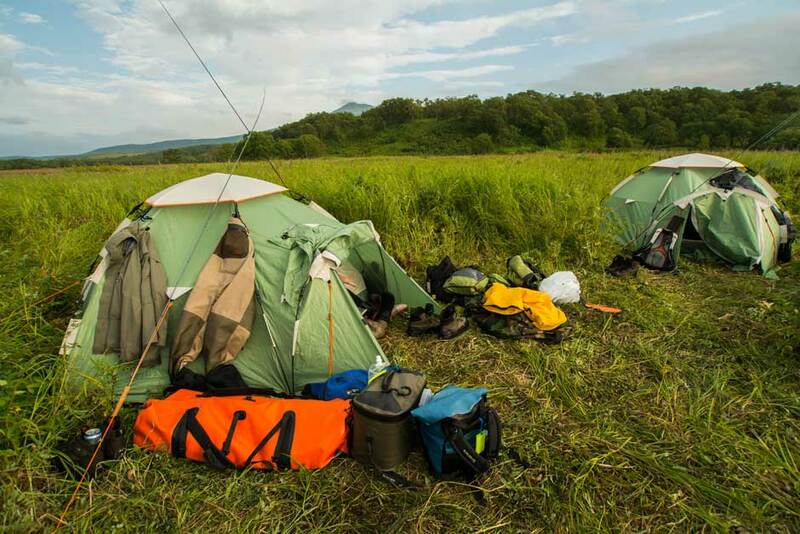 The Sedanka is also the most user friendly of all the rivers in Kamchatka, very easy wading and casting, extremely comfortable camps, a less intensive float schedule, and typically yields the highest numbers of trout taken relative to the other rivers. The Sedanka is also our recommendation for those anglers who are a bit worried about their physical conditioning and don’t want to work too hard. However, the more physically fit anglers will find the Sedanka a dry fly and mousing dream. Miles and miles of river remain untouched each week, and you can feel free to hike, explore, and fish as much water as you would like. In 2012, we began our initial explorations of the river system with two separate week-long wilderness floats scouting out two different sections of the river. What was discovered was a place of awe-inspiring beauty and an incredible diversity of life, both in the water and along its pristine shores. Fish readily take streamers swinging across the current, and as with other rivers in Kamchatka a mouse will almost always produce an aggressive take. As a spring creek system, there are ideal conditions for aquatic insect hatches, too. Though dry fly opportunities aren’t commonplace, they do happen throughout the season. A variety of salmon runs enter the river throughout the season, including king, chum, sockeye, and silver salmon. Because it is a spring-fed system, the river is always clear, and always wadeable. Our Savan River floats are set up exactly like our Northern River Wilderness Floats, utilizing hi-tech 4-season mountaineering tents and specialized cooking and camp equipment. A cook and camp assistant travel with the group, preparing tasty meals based on a combination of local fare and more familiar foods. Anglers are responsible only for erecting their two-man tents each day and breaking them down in the morning. Comfortable sleeping pads are provided, but you do have to bring your own sleeping bag and towel. For convenience of communication on the river and for a safety line to the outside world, each expedition is equipped with first aid kits, GPS, handheld radios, and a satellite telephone. These expeditions are organized to be flexible based on the exploratory nature of the fishing. There are several sections of braided river where we may stay at one camp for a few days to explore the multiple channels from a “home base.” Other sections may be fished quickly, covering 10-15 miles of water in a day to focus on the types of water that we find consistently hold the Savan’s massive resident rainbows. The boats are used exclusively for transportation, with all of the fishing done on foot. 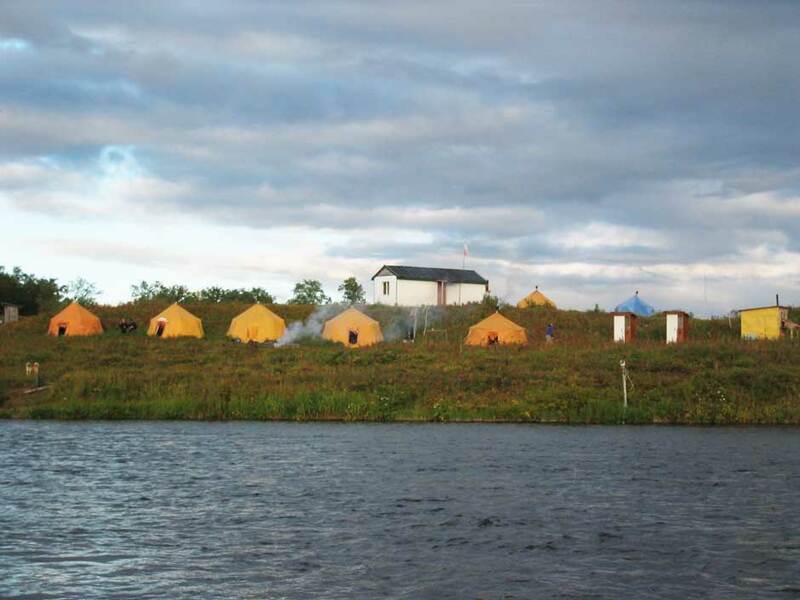 Savan Basecamp is the newest discovery on the Savan River system. For the last 3 years we have been floating the Savan and the Ichanga rivers, finishing our trips at the comfortable base camp. The fishing has been consistently amazing all the way to the takeout, leaving us to wonder what was downstream from the Base Camp. What kind of river monsters lay undisturbed in the lowest reaches of the Savan? This last season we set off to find out, bringing in Jet boats to explore down river and return every night to the comforts of the permanent Base Camp. It could not have been better. Every year we learn more and discover new secrets on our “NEW” river, the Savan, and this year, by adding the jet boat base camp, we were able to expand our reach to it’s maximum potential on this unbelievable system. Add to that the comfort of staying in the “lodge” all week, with flush toilets and hot showers, and you have Russian trout fishing’s version of luxury. At the Savan Base Camp, inflatable Jet Boats are used to access the lower rivers beats, allowing us to cover an amazing amount of excellent water below the lodge. We still have not explored it all! Wading is relatively easy to moderate for most anglers, but slightly more technical than the upper river. The lower river is bigger water, like in most rivers, and can be deeper and faster in some spots. We tend to fish the softer water, as this is where the fish hold, but we still need to wade over to them on occasion. There are many stretches of braided water, making the lower Savan feel much smaller than it actually is a lot of the time. Vast rolling mountains and volcanoes flank the broad valley as the river courses it’s way through the wild terrain. The lower river we cover is over 15 miles of pristine, untouched water. If you counted every channel of every braid separately, it would have to be way over 60 miles of water, far more than we were able to explore in 2 weeks of fishing with 4 anglers a week. The diversity in this section is also amazing. Different than the upper river, the Lower Savan had big broad runs as well as hundreds of smaller side channels, providing an unbelievably healthy trout habitat, with unique water around every bend. We were ecstatic about the outcome of this first exploratory season, finding a larger average size fish than we had anticipated and plenty of them. 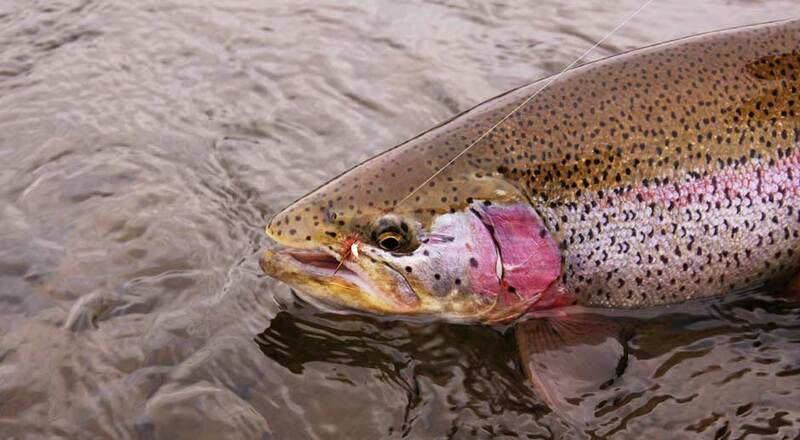 A huge part of the diet of the Savan river rainbow trout is eating mice. This is some of the most exciting trout fishing you will ever experience. Fishing with a mouse fly, you get the visual aspect of the surface strike, like in dry fly fishing, and the tight line grab of swinging, giving you the best of both worlds. When conditions change or the mouse bite slows a little, we can cast streamers, swinging across the current, to produce an aggressive take. As a spring creek system, there can also be ideal conditions for aquatic insect hatches. Though dry fly opportunities aren’t commonplace, they do happen throughout the season. The season at Savan Base Camp begins in the middle of July, and runs through August. A variety of salmon runs enter the river throughout the season, including king, chum, sockeye, and silver salmon. Our Savan River Base Camp is set up exactly like a stationary “lodge.” Everyone will get a double occupancy room in the spacious “Basecamp Lodge.” The lodge has 5 bedrooms and everyone shares an indoor hot shower and flush toilet. We are only taking 4 person groups at the Savan Basecamp in 2015, to ensure we are not crowded in the lodge or on the water. A cook and camp assistant are ever-present at Base Camp, preparing hearty meals based on local Russian fare. Anglers are responsible only for opening a beer at the end of a long day of fishing, and the guys will even do that for you, if you ask nicely. Comfortable beds with mattresses are provided, with a comforter and pillow, but we suggest you do bring your own sleeping bag and towel. For convenience of communication on the river and for a safety line to the outside world, Savan Base Camp is equipped with first aid kits, GPS, handheld radios, and a satellite telephone. These expeditions are organized to be flexible based on the conditions, the group, and the nature of the fishing. This is the beauty of a jet boat camp, being able to go where we think it will be best. There are several sections of braided river where we may spend multiple days exploring the many channels. Other sections may be fished quickly, covering the water, looking for the types of water that consistently hold the Savan’s massive resident rainbows. The jet boats are used exclusively for transportation, with all of the fishing being done wading. Although simple, there really is no serious roughing it with respect to the facilities in our permanent camps and lodges. Each individual camp varies from the next, however are all semi-permanent structures set up before the season. You will be surprised at the quality and comfort level of the accommodations. Each camp also runs full time electricity off of diesel burning generators, and all of the facilities in camp are heated with wood burning stoves. Sleeping quarters accommodate two anglers each, and consist of double walled sleeping huts or birch wood cabins appointed with comfortable framed cots, electric outlets, a plenty of room to store gear. The mess building is also heated with a full table setting for a very civilized and comfortable meal. Every camp has a separate heated showering facility complete with hot water and flushing toilets. A drying facility for waders and wet clothing is also a part of every camp — a warm and welcome place to slip on dry waders on a chilly morning. Common areas are paved with wooden planked walkways making barefoot walking comfortable. Each sleeping quarters is also connected by a riverstone or wooden pathway to the main fire pit. Of course if you are at the Zendzur Lodge, you return each day from the river to a welcoming framed lodge and all the creature comforts of home. The facility has double and triple occupancy rooms with private bathrooms and the amenities you expect from a wilderness fishing lodge. The highlight of any trip to Zendzur is the natural hot springs and banya to soak in and warm up after a day on the river. Russians in general are not known for their culinary expertise; however the food and drink on the float are good/decent considering the remoteness. Lunches are usually sandwiches with lots of fresh fruit, vegetables, cheeses, and breads. Dinners are always warm and fresh with lots of soups, noodles, pork, salmon, caviar, vegetables, fresh fruit, good coffee, fresh Russian beer and lots of vodka. Some of the happiest times are had with the Russian staff around the campfire sharing stories and passing the bottle. The camp schedule is very laid back and civilized. Your camp woodsman arrives at your tent or cabin early in the morning to light the fire in your stove and deliver coffee. Once everyone starts moving, anglers converge on the main dining facility for breakfast. Lunch is taken on the river and there is always time for a shower and a cocktail before dinner. We prefer to stress that although the accommodations have been labeled as “camping,” know that given the remoteness, the facilities are as comfortable as you can imagine. If you are reluctant to book a trip to Kamchatka for fear of being uncomfortable in camp, or are curious whether your spouse would enjoy the experience, we would love to go into more detail discussing the accommodations. Once managed with the right expectations, the most high maintenance people should be comfortable and happy in camp. NOTE ABOUT EXPLORATORY TRIPS & SAVAN / ICHANGA ACCOMMODATIONS: Northern Wilderness Exploratory trips and the Upper Savan/Ichanga float trips are set up as traditional “camping” accommodations without electricity, flushing toilets, etc. 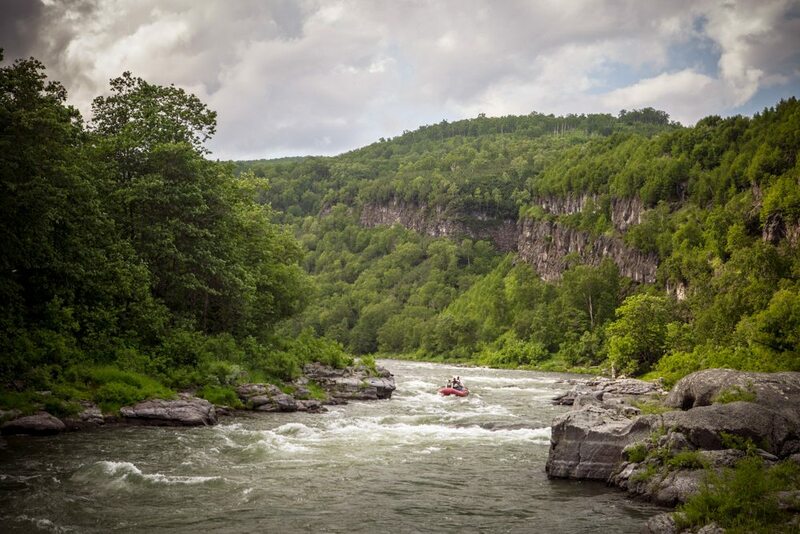 These programs are designed to be flexible and nimble as anglers explore new water on new river systems where permanent camps are not established. Kamchatka is only 4.5 hours flight time from Anchorage! After an overnight in Anchorage on Friday night, North American anglers travel to Petropavlovsk, Kamchatka on board weekly commercial flights with Yakutia Airlines on Saturday morning. 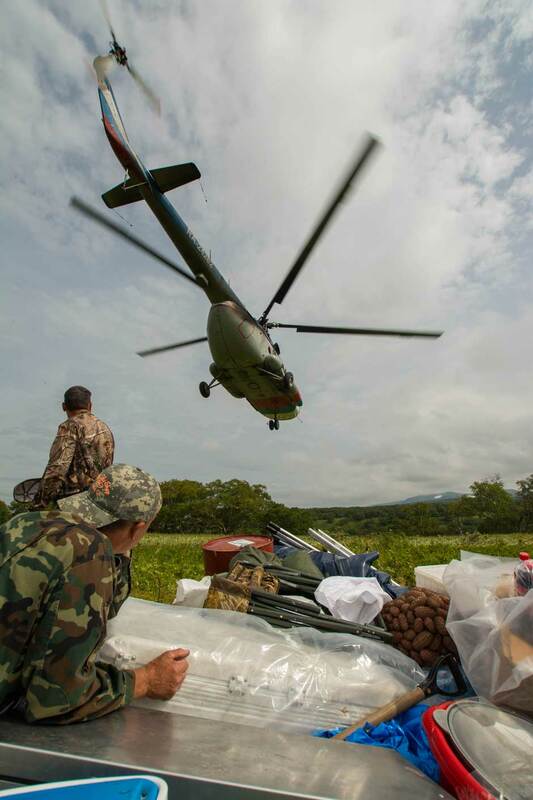 From Petropavlovsk (PKC), anglers are flown to camp on board efficient and safe Mi8 helicopters. The door-to-door time commitment is only Friday – Saturday. Upon arrival in Petropavlovsk, you will be transferred to the heliport, about 30 minutes away from the international airport. The Mi8 helicopter flight into the river takes a little under one hour. 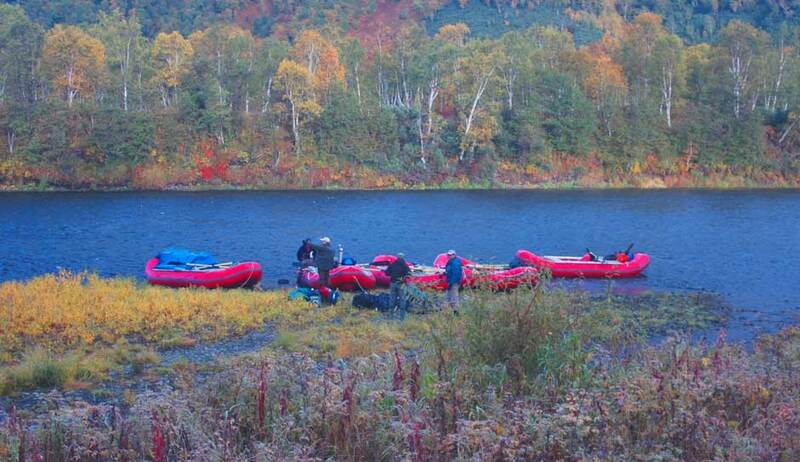 Float trip anglers are dropped at camp #1 while lodge guests continue onward an additional 10 minutes to the lodge. Anglers quickly unload, unpack, gear up, and start fishing. The Zhupanova River is conveniently located in the central part of the Kamchatka peninsula – and weather delays are comparatively rare. Upon arrival in Petropavlovsk, you will be transferred to the heliport, about 30 minutes away from the international airport. 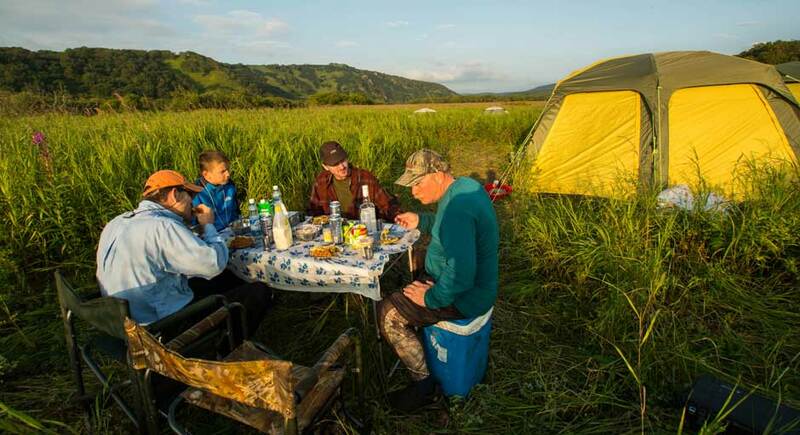 Anglers then fly north approximately 1.5 hours to a refueling station in the central Kamchatka town of Esso. Upon receiving weather clearance, anglers take off again and fly approximately one hour to camp #1 on the Sedanka. Wilderness float trip anglers are also on board these same flights north and share the chopper with Sedanka guests. Upon arrival in Petropavlovsk, you will be transferred to the heliport, about 30 minutes away from the international airport. The Mi8 helicopter flight into the river takes a little over 45 minutes. Anglers quickly unload, unpack, gear up, and start fishing. The Savan River is conveniently located in the southern part of the Kamchatka peninsula, and boasts some of the best weather in the region. Travel commercially from home city to Anchorage. Overnight in Anchorage at one of our recommended hotels. Most anglers stay at the Millennium Hotel on Lake Hood only five minutes from the airport. Anglers arrive into “P.K”, and are taken immediately to the heli-port for the helicopter transfer to your camp. Helicopter flights range from 45 minutes (Savan or Zhupanova) to upwards of 3.5 hours with a refueling stop (Sedanka). Upon arrival at camp, anglers will have a half-day of fishing, time permitting. Five full days of guided fishing. Following a proper half-day of fishing, anglers are returned via helicopter to Petropavlovsk to make the international connection back to the USA. Make connection onward to home. We are running weeklong and two week trips in July and August in accordance with the Yakutia Airlines North American service to and from Anchorage. 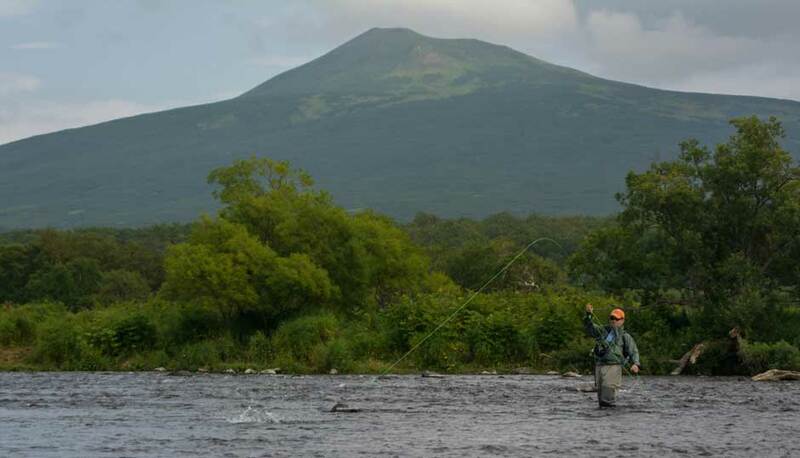 Anglers interested in fishing September are encouraged to travel to Kamchatka via Moscow. The weeklong trips are based on a door to door Sunday-Monday schedule with five full days of fishing and one half day on arrival day. There is no “best” time to visit Kamchatka as there are idiosyncrasies to each week on each river system. We would be happy to walk you through some hypothetical fishing conditions we have observed that can affect the style of fishing on any river system based on over a decade of experience fishing Kamchatka. Some weeks always fish better than others – but that is fishing – and folks should not try and predict the best time to go! Anytime the camps are open you should expect phenomenal fishing. When salmon arrive later in the season, a trout’s behavior is altered somewhat, however this does not adversely affect the overall fishing quality. Fish hold in different runs and the guides may mix up the areas fished to accommodate the evolution of the river once the salmon show up. This should not be a consideration when planning a trip because the numbers of fish taken remains fairly consistent no matter the time of year. The weather in late June and mid-July, and again in September is typically a little cooler than in late July and August. Guests who fish early and late season should expect lows in the mid thirties with the occasional frost, and highs in the sixties – seventies in a typical week. Later July and August has a little warmer and drier conditions as well, however any type of weather can occur on any given week. Although weather is extremely variable and always changing, in general the summer climate in Kamchatka is less harsh than what is typically found in Alaska and in more northerly climates. On any given week anglers should expect to fish in a tee shirt one day, and be piling on the layers and rain jacket the following. No-see-ums, white socks, and Mosquitoes are found in greater numbers during July and August, and are usually completely gone by September. Kamchatka itself is also of interest. Its natural wonders are at least as diverse and breathtaking as those found in Alaska, maybe more so. The famous Valley of the Geysers, Nalichevsky National Park, Timonovskye Hot Springs, Avacha Bay, and Kurilskoe Lake Brown Bear Preserve are easily accessible day-trips, based out of Petropavlovsk. The helicopters used to access the remote wilderness of Kamchatka are known as the Russian made Mi-8. Although cosmetically these choppers can use some work, they are actually very solid aircraft with flawless maintenance records. They are used by over fifty United Nations countries worldwide, and have proven themselves with millions of hours flown in both military and civilian usage. The Mi-8 is to Kamchatka what the floatplane is to Alaska. There are over eight hundred on the peninsula performing numerous tasks including hauling Americans and their gear to the most remote corners of Kamchatka. Nearly all of our clients comment on how smooth, powerful, and stable these workhorses feel while in flight. With two jet engines and an 18,000-pound payload, the Mi-8 rarely operates at half its capacity. The Russians are extremely cautious about flying in poor weather, and unlike an airplane if you run into poor visibility, the pilots can simply turn around. We have been pleasantly surprised at the quality of the staff in Russia. There are dozens of service-oriented personnel who ensure that these trips function as planned, and that anglers are happy and comfortable. From the moment you arrive in Petropavlovsk you are met by competent English speaking escorts who transport anglers to the heli-port for the flight to the river. Each program consists of the following staff: American head guide, Russian guides, cook, and two “woodsmen.” The woodsmen are there to ensure that fires are always lit, the generators are running, the shower is always warm, and that guests are comfortable. The Russian guides are intimately familiar with the rivers fished, and do an excellent job of finding fish, reading water, assisting with casting instruction, rigging equipment, etc. The Russians are also extremely safe, friendly, and knowledgeable, in addition to excellent guides. Fishing and socializing with the Russians is a very interesting experience and one of the most memorable aspects of the entire trip. They are a delight to talk with, are great hosts, and are very forthcoming with tales of their life in the former Soviet Union, Russia, and in Kamchatka. The Russian staff is well educated, well traveled, and add a wonderful uniqueness to the adventure. Each program also has an American representative who acts as your liaison and head guide. Every program has a staff that has been well trained in providing the creature comforts and quality service that we Americans expect. It is also important to note that every camp has a host of dogs on camp known as Laicas. These ancestors to the American Husky are used to scare away bears and make nice companions. ***We will provide all Kamchatka participants with detailed information on how to obtain the aforementioned travel requisites upon booking. Tailwaters Travel must adhere to the cancellation policies of the guides, outfitters and lodges which it represents. Our Kamchatka Outfitter’s Policy Follows: Before 2017 season rates and flight schedules are confirmed, a fully refundable $1000 deposit/week/angler is required to confirm initial reservations. Once 2017 season rates and schedules are confirmed, the balance of a 50% deposit will be due and all deposits and final payment funds become non-refundable. After 2017 rates and schedules are confirmed, no space or guides will be held without receipt of deposit beyond 14 days from reservation. Full pre-payment is due May 1, 2017. 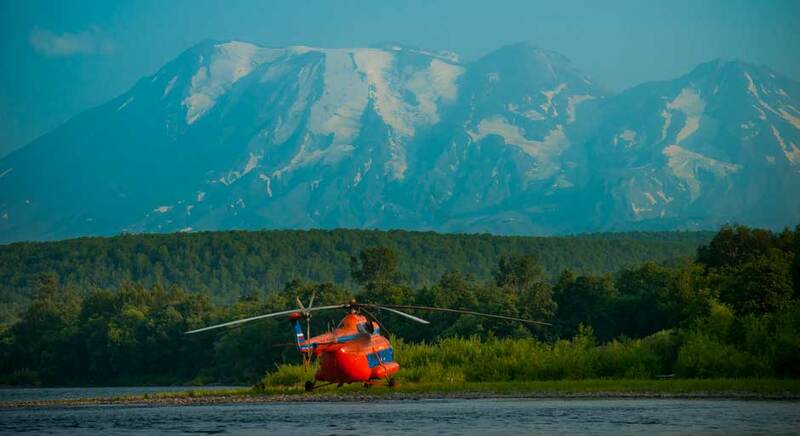 Medical evacuation insurance is mandatory for all expeditions to Kamchatka. Refunds of deposits/payments made on credit cards will be charged a 3.5% service charge to fully compensate Tailwaters Travel for bank charges incurred, in the event that a replacement angler is found. Tailwaters Travel will make every effort to help locate a replacement angler should a cancellation be necessary, however does not have any responsibility to do so. If the traveler or Tailwaters Travel arranges a replacement, a $150 replacement fee will be charged. Again, since this is a trip that most people plan months in advance, finding a replacement for this trip on short notice can be very difficult, and at times, impossible. Most anglers traveling to Russia make their plans far in advance, some as much as one year. Refunds or credits cannot be issued for fishing time lost due to inclement weather. Receipt of deposits and/or final payment is acknowledgement that registrant has read and accepts the cancellation/refund/responsibility clause.